This Spaghetti Spider Web is a unique and fun craft for toddlers and preschoolers to celebrate the Halloween season. What child doesn't like spaghetti, especially when they get to squish their hands through it? 1. Paint your paper plate black and let it dry. Mix 1 Tablespoon of glue with 1 Tablespoon of paint in a bowl. Add 1 Cup of cooked, cooled spaghetti and stir until the spaghetti is covered (if you want to use more or less spaghetti just remember, one part glue, one part paint). 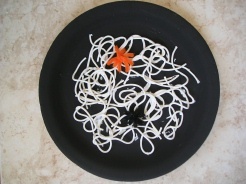 Arrange the spaghetti on the paper plate in any design you choose. 3. Cut your pipe cleaner into 4 small pieces. Wrap the pieces around each other to make a spider. Stick the spiders into the web where ever you'd like. 4. Place your paper plate on a shelf to dry, at least for overnight. If you want to hang your creation after it's dry, just punch two holes on either side of the plate and string some yarn through.